Slogging through the Tivan desert toward the monument plateau, Teferi said, "Mark my words, this time I'll have the answer." It was morning and the sun was already high and hot, stirring the dust. Behind them in the distance were the palm trees of the oasis where they had camped last night. Not far ahead was the monument, a giant block of stone partially concealed by a natural plateau. Travelers from Femeref who passed by on the nearby trade road always assumed it was an ancient ruin. It was ancient, but younger than Teferi. It was also a puzzle he had been trying to solve for years. Assuming an expression of pretend inquiry, his daughter Niambi said, "What's the definition of insanity again?" Teferi laughed. "That's only if you don't have a method to your madness, and I always have a method." "Oh, if we only knew what that method was," Niambi countered with a grin. "I think this is the day," he told her. "He won't beat me again. Especially now that I have your help." Teferi reached the foot of the plateau, where the sand was a thin layer over paving stones. With his boot, he scuffed it away from the center-point seal. "It's just a theory," Niambi cautioned. "I don't want you to get your hopes up." "My hopes are always up." Teferi tapped the seal with his staff. A seam opened in the paving, the sand sliding into it like flowing water. The seam ran across the buried plaza to the foot of the monument. Stone grated as the halves separated and pushed open to reveal a triangular well with broad steps leading down. Niambi eyed it warily. Even after their previous visits here, she was still cautious of the monument. It wasn't an attitude Teferi cared to discourage, since the monument was just as dangerous as Niambi thought it was. She said, "You know he's not really here, right?" "He's here in spirit. And that's close enough, believe me." Teferi went down the stairs, sand scraping on his boot soles. The steps ended at the entrance to the monument's main hall, which at the moment was a dark cavern stretching away under the heavy rock. Stepping aside, he waited to make sure Niambi didn't need help. At fifty, his daughter was still strong and capable, but this wasn't a good age to take a fall. He should know; he aged so slowly, he had been fifty for more than a few decades now. The lights, powered by the same part-mechanical, part-magical systems as the entrance, began to glow softly, brightening like embers stirred in a hearth. Encased in crystal lozenges, they hovered near the ceiling, illuminating walls covered with arcane writing. Teferi had already deciphered it over the years, hoping for clues. There had been none, and he suspected the inscriptions were just another trap for the unwary, meant to waste the time of anyone trying to penetrate the monument's secrets. He started down the hallway, Niambi behind him, their steps quiet. Teferi had done this many times already, alone and with Niambi, and they both knew the time for levity had passed. Teferi had defanged many of the monument's traps already, but it still had the potential to bite. They reached the first junction, where three archways marked corridors leading off in three different directions. With no warning, a dark shape lunged at them out of the right-hand corridor. 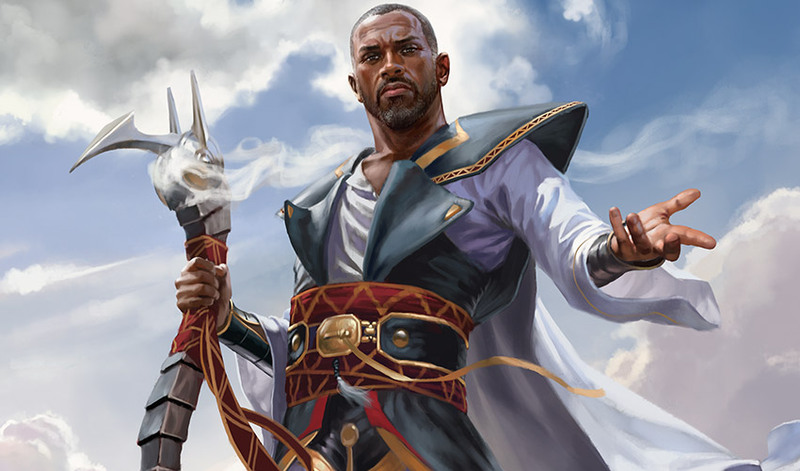 Teferi had expected to encounter it at some point near here, but its sudden appearance startled him enough that the time spell he reflexively cast blasted it so hard it separated into its component parts. He sighed with annoyance at himself. He didn't like to overreact, but the thing should have known better than to charge so suddenly when his daughter was standing behind him. The automaton was a good eight feet high, made of silver and copper metals, shaped like a bulky warrior with a block for a head. Its parts had separated and hung in midair: limbs, the cogs and wheels that drove it, the crystals that supplied its power. It wasn't quite still; all the pieces were vibrating faintly, caught in a timestream where the explosion that had blasted them apart was ever so slowly occurring. Niambi eyed it warily. "Is it safe?" "Yes, but don't touch." Teferi moved farther into the junction, where he could watch all three corridors. Niambi stepped closer to the automaton to study it. She frowned. "I recognize the marks on the carapace. I'm sure you destroyed this one the last time I was here." "I did," he told her. "I think they repair each other." "Oh, lovely." She grimaced and stepped back. Of the three corridors, two were always traps, but which two changed every time. Teferi read the floating, shifting glyphs that revealed the right passage, then triggered and disarmed the death light from the giant eye around the first bend. With that done, he and Niambi were able to proceed to the chamber of poisoned needles. It was a relatively easy one, since Teferi was able to stop the needles once they were in the air, though there were occasionally tricky patterns. As Niambi gathered the skirts of her robe close and picked her way carefully around the hovering needles, it reminded him again of their earlier adventures here. He smiled fondly and said, "Do you remember the mechanical spiders?" "Yes, Father. Every time I have a nightmare," Niambi said drily. After two more automatons in the last passage, they came to the central chamber, the heart of the monument. As they stepped from the corridor onto the wide ledge, the light gradually crept up the walls, revealing the true size of the enormous space. All along the upper part of the walls, hundreds of feet up, round doorways for chambers and passageways glowed with light or were dark with shadow, looking down on the central platform and its deceptively simple grid. Teferi had searched all these openings before, and knew they were all just distractions, traps for the unwary, delaying tactics. It was the grid of squares on the center platform, reached by a narrow bridge, that was the real key to the puzzle. Or possibly the floating blocks were the key. Teferi had spent a long time narrowing it down, and he was certain now it was one or the other. Niambi had a new theory about the blocks, and that was why they were here. As the light grew brighter, the blocks started to drift into view. They were stone oblongs of a uniform size, floating up from the shadows below and down from above. They would move randomly around the space the entire time Teferi was here. Her expression determined, Niambi took her writing tablet and pencils out of her pack. "Ready." Teferi walked across the bridge, Niambi following. As he set foot on the center platform, the floating blocks converged. Niambi crouched down and began scribbling hastily on the tablet while Teferi deflected the blocks that were trying to crush them. After a short time, Niambi called out, "Try six from the left, four from the top down." Teferi hopped over to hit the sequence with his staff. Nothing. "No change, next," he reported. And so it went, sequence after sequence. Two more automatons climbed up to challenge Teferi. One he froze in time and the other he tipped off the platform with some quick staff work. Occasional sharp gusts of air battered him and Niambi, raising stinging dust and pulling at Niambi's braids. Then bursts of heat and light. Teferi deflected what he could, endured what he couldn't, and kept entering the sequences Niambi came up with. After more than an hour, Niambi said, "Father, that's it, we have to stop!" Teferi left the grid immediately and helped Niambi to her feet, and they retreated across the bridge. As soon as they reached the passage again, all activity in the chamber began to slow and cease. Niambi sagged against the wall, sweat beading her forehead. "I was wrong, it's not a mathematical problem. Or if it is, it isn't the floating blocks that are the key." It was disappointing, but Teferi was ancient enough to take the defeat with no more than a sigh. "It was still a good theory. It had to be tested." Niambi shook her head. "I wasted your time." He gave her a one-armed hug. "Please. Every father should be so lucky to have a daughter who shares his hobby." Her laugh turned into a half-sob of exhaustion. "Oh, let's get out of this terrible place." It wasn't until they were safely through the monument and outside, slogging back through the sand toward their oasis camp, that they could talk again. "Why would he make it so hard?" Niambi said, frustrated. "He must have known you would need it someday." Teferi gave the stock answer. "He's protecting it from Phyrexians, and the demons and their mages, and everyone else who might want it for the raw power locked inside." Niambi snorted. "You don't believe that." She knew him too well. "I don't, but it's the answer everyone wants." "I know, I just . . ." Niambi gestured in exasperation. "You were his friend! Why would he do this to you?" Teferi shook his head. "Urza didn't have friends, not like you and I have friends. He had experimental subjects, and those just powerful enough that he considered them sentient beings, if not actually people. But he was what we had at the time." A shadow fell over the sand. Teferi's instinct said "dragon," and even as he looked up he was ready to cast a spell. But the thing above them was shaped like a boat, and it was strangely familiar . . . It couldn't be what he thought it was. "A skyship?" Niambi said. She stared at Teferi. "Is it here for you?" Teferi smiled slowly. It was what he thought it was. "It's my past, catching up with me." Gideon climbed down the ladder from the Weatherlight, dropping the last few feet to land on the sand. Filled with long shadows from the sunset, the oasis had a large pool surrounded by sparse grass and palm trees, partially sheltered from the wind by rocky outcrops. Some tumbledown abandoned huts stood on the far side of the water, perhaps marking a time when this area had been more traveled. The current inhabitants had made a neat camp lit by a few torches, with a blue canvas tent and a firepit, and rugs and grass mats unrolled on the packed sand for seating. He had arrived just in time for the introductions. Like Shanna Sisay, both the people they had come to meet were dark-skinned Jamuraans, a tall well-built older man with short graying hair and a lovely woman about the same age, with strands of gray threaded through her long braids. Jhoira explained, "Gideon and Liliana are Planeswalkers." "Ah, I used to do that." Teferi smiled, as at ease as if they were discussing any other common interest. "This is my daughter, Niambi." "I'm sorry, your daughter?" Raff asked, confused. "My father used to be an immortal," Niambi explained kindly. "He ages very slowly. I've been catching up to him for years." Teferi gestured for them to come into the camp, and as they all took seats around the fire, he said, "And to what do I owe this visit?" Gideon was a little startled when Jhoira cut right to the point. She said, "We're going to kill Belzenlok and we need a time mage to help us get into the Stronghold." Teferi lifted his brows. "A time mage. And you think I know a likely one?" With an indulgent smile, Jhoira said, "Teferi, don't tease. You know we need your help." Teferi leaned forward, his expression turning serious. "Jhoira, we're not camping in the desert because this is how my daughter and I enjoy spending our leisure time. We're working on something very important." "Like what?" Liliana asked, watching him with narrow-eyed speculation. "That ancient ruin, maybe?" "It's not that ancient," Teferi corrected. "It's younger than me." Gideon had been trying to get a sense of Teferi's character, and he thought the man might want to help them. Which meant the reason he was out here really was important. He said, "Perhaps a trade? We help you with your quest, you help us with ours?" Teferi eyed him thoughtfully. "You assume you can help me." With a sigh, Niambi said, "He doesn't want help; he's stubborn, and he wants to do it himself." Teferi turned to her. "Oh, the unfairness! I would be happy to accept help. I'm just saying—"
"Let them try, Father! It's important!" Niambi said. "And once it's done, you'd be free. I've heard you talk about your friend Jhoira. I know you want to run off and have adventures with her again." Jhoira held out placating hands. "Just what is it you're trying to do? Does it involve the ruin?" Teferi regarded her for a long moment. Jhoira reached over and squeezed his hand. She said, softly, "Let us help." Teferi let out his breath. He looked at Gideon and the others and said, "Do you know the story of Zhalfir?" Raff nodded, and added, "It removed itself from Dominaria to get away from the Phyrexian invasion." Shanna's expression turned wry. "That isn't quite the story I heard." Liliana looked impatient, and Gideon said, "What is the story?" He looked out over the dark desert, where the wind blew drifts off the tops of the dunes, the crystalline sand catching the last of the light. "I wanted to spare my people and my homeland from a war I knew would destroy them. So I created a time rift and phased Zhalfir partially out of this plane. The Phyrexians couldn't reach it, but Zhalfirins couldn't reach the rest of Dominaria, either. They still can't." Into the silence, Shanna said gravely, "There were many Zhalfirins in Femeref and Suq'Ata and other places, who could never return, who lost all or part of their families, who lost their homes." "Yes," Niambi told her. "It made Father very unpopular in our folklore, for some time." Shanna nodded sympathetically. "I thought he might be that Teferi." Teferi half-bowed to her with a smile. "The very one." Jhoira added, "He did the same to the land of Shiv. But later he was able to repair the rift and return Shiv to this plane. That's how he lost his Planeswalker spark." Liliana lifted her brows, startled. "Really?" "Yes. It left me unable to return Zhalfir." Teferi made a gesture, taking in the desert around them. "So here I sit." "He hasn't been just sitting in the sand here the whole time, don't feel too sorry for him," Niambi put in. "Stop mocking your father's existential pain," Teferi told her. With an ease that suggested she was well used to dragging Teferi back on track, Jhoira said, "But you have a plan, I assume? You always have a plan." "I have a plan, but it isn't going very well," Teferi admitted. "I discovered some time ago that my friend Urza had left behind a series of devices and magical artifacts that could be of some help in repairing a time rift. I've been searching a long time, but I've only found the location of one artifact. It's here, in that monument. I hope that if I can retrieve it and unlock its secrets, it will lead me to the other objects. But I've been inside the monument many times, uncovered its secrets and sprung its traps over and over again, and I still haven't been able to get to the artifact." Gideon was glad to hear Teferi's mission was a good cause. If they could help him complete it, it would be all the better for Dominaria. 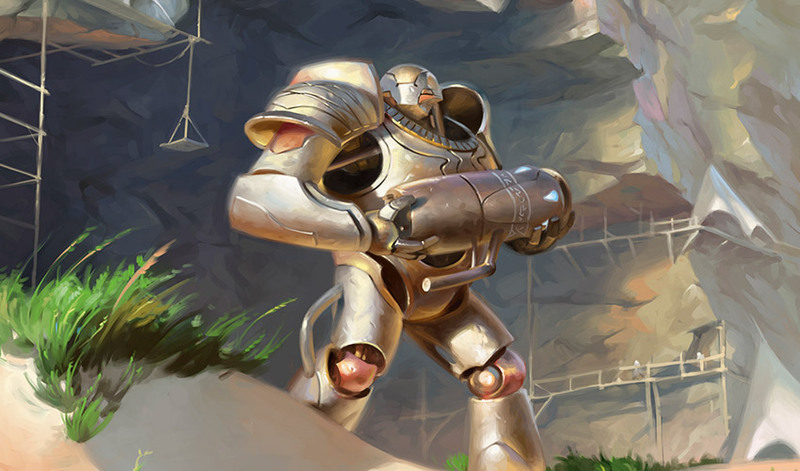 "Who was Urza hiding the artifact from? The Phyrexians?" "No. From me." Teferi's smile was dry. So that was how it was. Gideon said grimly, "That's not very friendly." "That's what I said," Niambi said. She added, "For the past ten years or so I've been trying to help Father. I had a theory that the central puzzle of the monument was actually a mathematical equation, but we tested it today and it didn't work." "What was the equation?" Jhoira asked with interest, and two sentences into the explanation Gideon was thoroughly lost. As Jhoira and Niambi discussed it, he said to Teferi, "If there's any help I can give you to get your artifact, I will. But we're committed to killing Belzenlok." He glanced at Liliana. Raff explained, "They're helping us kill Belzenlok so then they can go kill Nicol Bolas. Everyone's helping each other." Liliana stared incredulously at him and he added, "It's not a secret, is it?" "Loose lips get skyships destroyed," Liliana said, darkly. "You're a necromancer." Teferi studied Liliana thoughtfully. "I take it you have a personal interest in fighting the Cabal." Liliana eyed him. "Yes, and personal means it's none of your business." Teferi lifted his brows, but said kindly, "Oh, believe me, I've had plenty of experience cleaning up past mistakes. And when you spend so much of your life as an immortal Planeswalker, the mistakes tend to be grand in scope. It isn't possible to erase them, but with effort you can eventually balance your account." Gideon could see Teferi's words hit home. Disgruntled, Liliana frowned and looked away. Gideon thought of his own mistakes, the lost lives he could never make up for. He said, "Liliana is important to our plan to destroy Nicol Bolas. Once we kill Belzenlok, we'll both be free to leave the plane and rejoin our friends." Liliana said in exasperation, "He hasn't agreed to help us—stop telling him things. And we don't know our 'friends' want us to rejoin them at all." "That was all a misunderstanding," Gideon protested. He was sure that if they could all just talk, it would be fine. Then Jhoira and Niambi pushed to their feet, still talking. Shanna, who had been listening to their conversation, stood and dusted the sand off her pants. She said, "We're going back to the monument for another try. Jhoira thinks Niambi has it right, but there's some factor she couldn't take into account." It was full dark now, the moon rising, as they set out for the monument. "You think you can solve it in one try after I've been working all this time," Teferi said to Jhoira as they trudged through the sand, her mechanical owl flapping ahead of them, glowing as it lit the way. Jhoira elbowed him in protest. "No, I think you and Niambi solved it. But I think Urza never played fair, and he certainly wouldn't play fair with you." She had a point there, Teferi admitted. Once inside, Teferi led them through the monument's defenses to the central chamber. As he disarmed it again, he thought the place had a different feel. The shadows thicker, the stone walls radiating cold. Maybe it was just that it had been many years since he had come here at night. Finally they stood on the ledge near the walkway to the platform grid. Gideon and Shanna moved to opposite sides, to keep watch for randomly attacking automatons, while Jhoira explained her theory. "I think Niambi is right about the mathematical significance of the movements of the floating blocks, but I think there's an extra factor. This is Urza we're talking about, and he must have known it would be Teferi who would try to solve the puzzle." The young mage Raff crouched down to study the script carved into the walkway. "You think he tailored this place specifically to prevent Teferi from solving it?" "Worse, I think he cheated," Jhoira said. "Liliana, do you see any ghosts here?" Liliana stepped to the edge. Her expression intent, she looked down into the well, then up at the levels above. "Not yet. But if you're right, they won't appear until the rest of this show is triggered." She waggled her fingers, indicating the central well around them. Teferi didn't want to be a spoilsport, but had to point out, "If there were things in this chamber out of phase, I'd see them." "That's why I don't think they're out of phase, I think they're ghosts." Jhoira gestured around. "Trapped spirits, held here by spells. This chamber is buzzing with spells, and not all of them are artificer work." Raff nodded and pushed to his feet. "I'm getting some of that too, though not as much as I bet you're picking up." "Raff, get out of the way so we can get this started." Liliana rubbed her hands together briskly. "This is going to be fun." "Restoring Zhalfir is not fun," Teferi corrected sternly. All right, it was a little bit fun, but he felt it was better to maintain decorum in such a dangerous place. "It will be if this works." Niambi gave him a push. "Go on." "Be ready," Teferi cautioned them all. "The worst will start as soon as I reach the grid." He stepped onto the narrow bridge and walked out to the platform. The floating blocks drifted into view as usual and Jhoira counted them aloud for Niambi. Then Liliana said, "Aha, there are spirits here." "How many? What direction?" Niambi asked, excitement in her voice. Teferi kept his gaze on the grid but had to ask, "What do they look like?" Liliana said, "Imagine a drift of mist, very faint. Ghosts like these lose cohesion after time, and these are far too old to have forms. Oh, two more, second level floating down." Niambi's pen scratched frantically, then she called out, "Two down, north quadrant, from the top!" Teferi entered the sequence with his staff. They continued, Jhoira counting blocks and Liliana counting captured spirits and Niambi calculating. The automatons appeared, but Shanna and Gideon rammed them off the ledge to tumble down into the well. As Niambi's calculations revealed more of the pattern and Teferi tapped more squares, the onslaught doubled and redoubled. It was as if the place sensed Teferi was close to a solution and was determined to stop him. Jhoira and Raff cast defensive spells on the ledge as Teferi froze the automatons that climbed directly up the sides of the grid platform. He had never been attacked here like this, not once in all his efforts to solve this puzzle, and his heart started to pound. They had to be on the right track. Then Teferi hit a square and the platform grated under his feet, groaning with the deep rumble of stone and metal grinding against each other. He leapt back, braced for a new attack. But the square in the center slid ponderously aside to reveal an opening. This is it! This is the solution! Teferi flung himself down and reached inside. A chorus of warning shouts echoed off the stone, but Teferi knew there was no trap here. His fingers brushed metal and he pulled the artifact out. He got to his feet and held it up. Around him, the chamber went silent, and like clockwork wound down to stillness. The blocks drifted downward to disappear into the well. The automatons froze in place. Teferi held a delicate dark crystal orb nestled in a cage of silver vines. Lights glowed inside it like a captured starfield. He turned to face the others. Jhoira was triumphant, Raff impressed, and Liliana trying not to look impressed. Gideon and Shanna seemed relieved and interested, each surrounded by a heap of broken automaton parts. Teferi met Niambi's jubilant gaze and slowly grinned. He said, "We won!" Urza had expected Teferi to be alone here, and had geared all his defenses that way. I'm not like you, Urza, Teferi thought. You never could see any other way but your own. Then an ominous rumble sent dust raining down from above. "I'm sure it won't surprise any of you to know Urza was a sore loser," Liliana called out. "I think this place is collapsing!" Teferi strode across the bridge to the ledge. He handed the artifact to Jhoira and grabbed Niambi's hand. "Everyone, come on!" Cracks spidered across the walls as they ran through the corridors, the ground shaking under their feet. Teferi froze falling blocks and spelled the ground to keep it from splitting under their feet. He could tell the place was fighting him, resisting every step. When he was at the limit of his strength, they burst out the entrance into bright moonlight to find the triangular well filling with sand. Jhoira's owl flew in agitated circles overhead and she shouted, "The plateau is sinking." Teferi tried to freeze the sand in place but there was too much of it. It poured into the well like an ocean, and if they tried to push through it would surely drown them. Then two ladders dropped from above and Teferi realized the shadow blotting out the moonlight was the Weatherlight. "Come on!" Jhoira shouted. "Everyone climb!" A Serran angel dropped to land in the rising sand before them. Teferi pushed Niambi toward her and said, "Take my daughter!" "Hey!" Niambi objected, but the angel caught her around the waist and leapt upward into the air. The hard flap of her wings blew the sand back enough for Gideon to wade forward and catch a dangling ladder. He held it steady for Liliana. Shanna gave the shorter Jhoira a boost up to the other ladder, and Jhoira swung to one side so Shanna could scramble up with her. Gideon grabbed Raff by the collar and shoved him up after Liliana, then hooked an arm through the lowest rung. 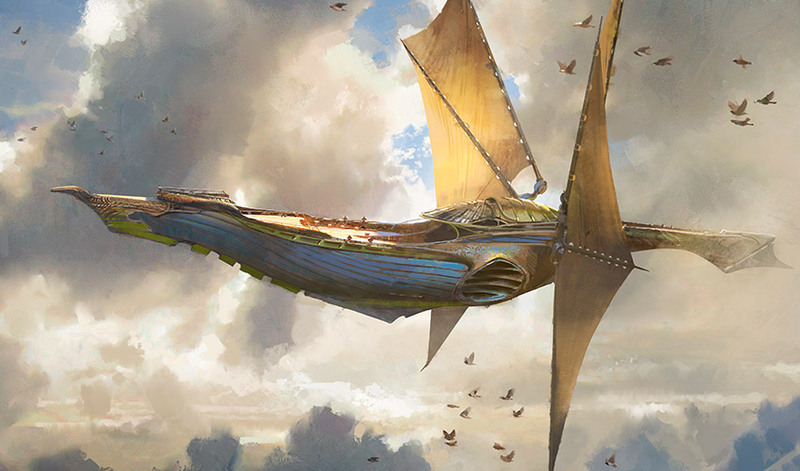 Waist deep in sand now, Teferi grabbed the end of the other ladder, and the skyship lifted, pulling them upward. As soon as the ship's motion freed his legs from the clinging sand, Teferi followed the others up. The person who caught his arm to help him swing over the deck rail appeared to be a vampire, but no one else seemed to find this unusual. 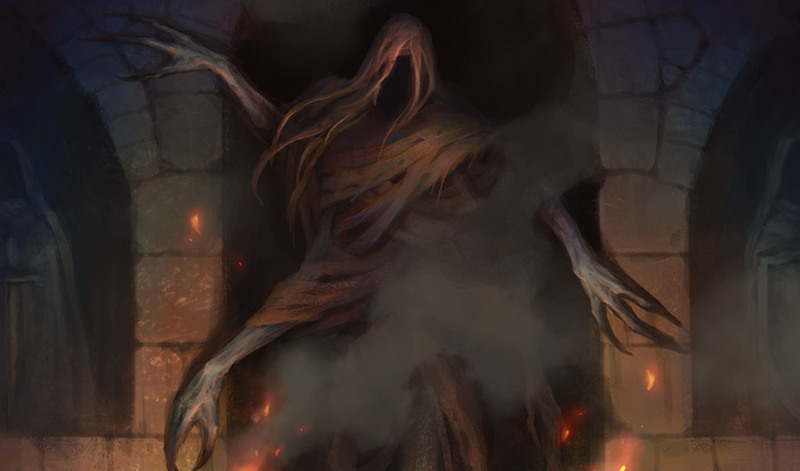 As Teferi shook the sand out of his clothes, Niambi gave him a hug and protested, "I could have climbed with everyone else, Father." That wasn't a chance Teferi had been willing to take. He just turned with her to look down at the monument. 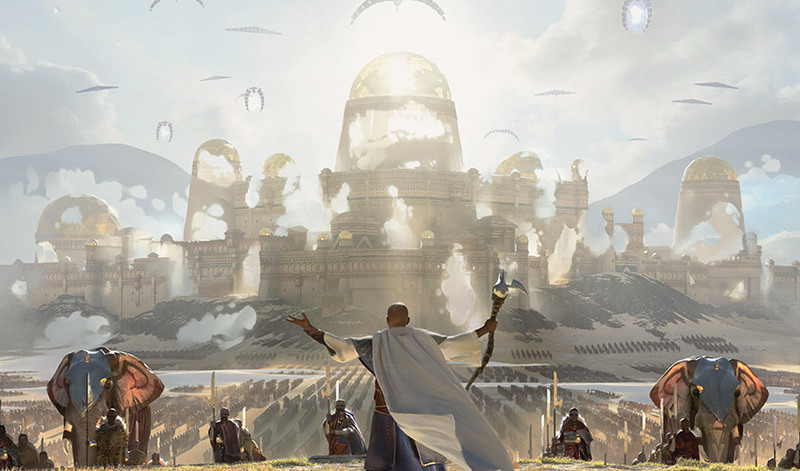 Raff sent glowing orbs into the air, and by their light Teferi saw the great stone building was all but gone. 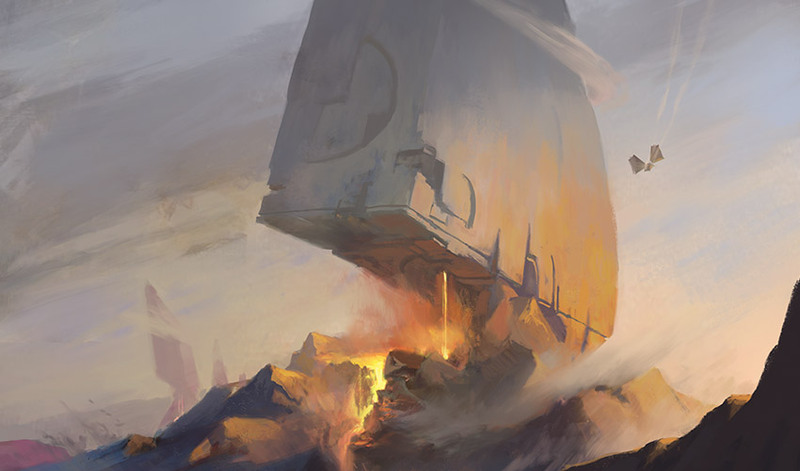 As Teferi watched, the last of the plateau sank into the earth, sand swirling around it like a whirlpool. Beside him, Jhoira held out the artifact, its central crystal glinting in the light of Raff's magic and the skyship's deck lights. Laughing with delight, she said, "So, are you coming with us to help save the world? Again?" Teferi let his breath out and smiled slowly. "I think I will." After a stop to collect Teferi's and Niambi's belongings from their campsite, they all spent the night on the Weatherlight. 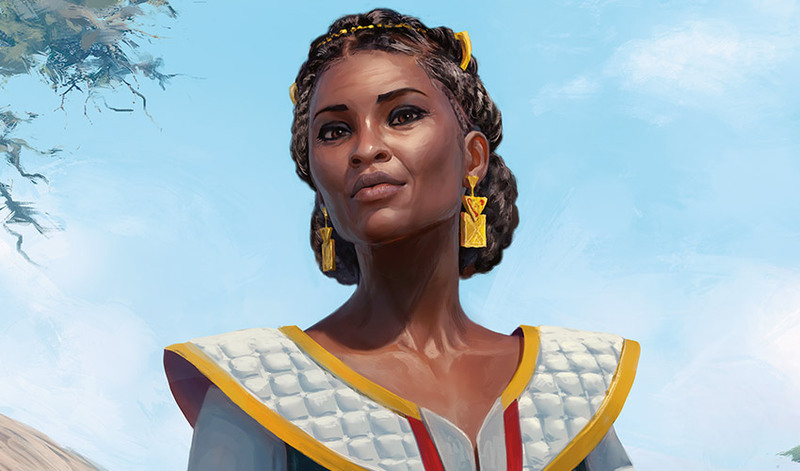 Jhoira was glad to have the chance to talk with Niambi, and hear about Teferi's life in Femeref. They had a lot of catching up to do. The next morning Jhoira steered the skyship to the town Niambi and her family lived in, to take her home. It was a small but prosperous-looking town on the cliffs above a river, where houses with tile roofs were surrounded by orchards and gardens. Niambi's house was on the outskirts, a rambling stone building with a central fountain court shaded by acacia trees. Jhoira stood by while Teferi and Niambi said goodbye on the deck of the Weatherlight. As Niambi hugged him, she said, "Have a good time with your friends. Kill lots of demons." He answered teasingly, "You aren't even going to pretend to miss your old father." "I will miss you, but I know you too well." Niambi gave him a shake. "This is what you were born to do. And once you've found a way to return Zhalfir, I expect you to visit so you can give us all a tour. Or warn us, if they want to kill you." Once they were under way, Jhoira left Tiana to steer the ship and went to her captain's cabin. With a sigh she dropped into her chair. It was a relief to have Teferi back. 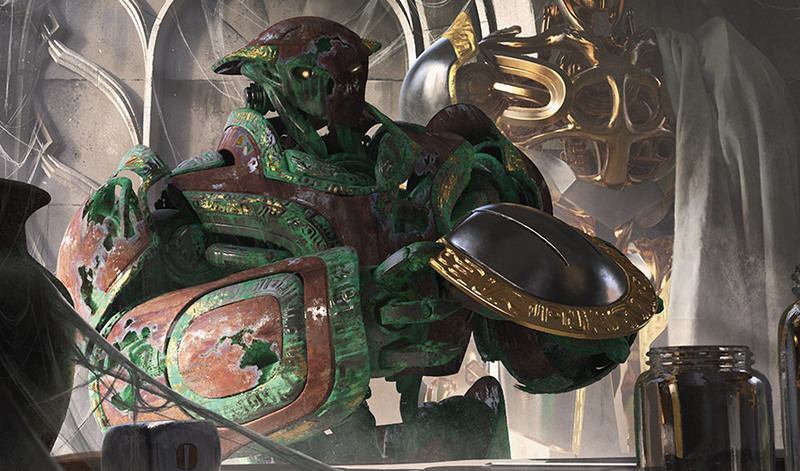 Only a few more pieces to put into place and they would be able to break into the Cabal's Stronghold and kill Belzenlok. But that was the easy part. She touched the amulet around her neck, then opened it. Inside lay a small Powerstone, glittering in the dim light. She had made this stone herself at the Thran Mana Rig. It held Teferi's Planeswalker spark. The hard part, she told herself, is going to be convincing him to take this back . . .